The moderator, elders, delegates, and congregation of the Dix Fork Old Regular Baptist Church gather around to close out a river baptism with prayer. Just out of sight, Sister Ruth Vanhoose stands soaking wet in the small gravel lot, wrapped in a towel, her clothes trying to dry in the July sun. She was surrounded by blood kin and church family, on the banks of Big Creek in Pike County, Kentucky. Minutes earlier, in a public declaration of faith, she cast off her former self of 84 years, and was baptized in this small, quiet stream. This was an Old Regular Baptist baptism of total immersion. I attended the service prior to the baptism and with the permission of the moderator, recorded the service, which included incredibly beautiful lined-out hymnody singing. This is a tradition of singing, worship, and baptism that is slowly fading away like many other parts of mountain culture. I'd love to do some more extensive visiting and work with Old Regulars in eastern Kentucky and southern West Virginia. I sometimes think it's too good to be true When they talk of life's fair river Of that city so bright, where there is no night In that beautiful, that blessed forever. And I sometimes ask when I'm weary and sad, That the golden gates were nearer, But I know I can wait for a joy so great In that beautiful, that blessed forever. And I sometimes ask, when I think of the end, Will the Lord on me have pity. Will He bid me come to His own dear home, To His own everlasting city. And I sometimes grieve for the friends I must leave, For the bond is hard to sever. But the joy is so sweet, when I know we shall meet, In that beautiful, that blessed forever. And I sometimes think of the dear old Saints, On the banks of Jordan's River, Who with weary hearts are waiting to depart, To that beautiful, that blessed forever. And I sometimes pray on my toilsome way, For the faith of the true believer, Whose hopes shine bright, as the stars of the night, In that beautiful, that blessed forever. As far back as I can remember, well before picking up a camera, I've been fascinated by the serpent-handling faith. This religious tradition has long been ridiculed and used as an example to highlight the Appalachian backwoods stereotype. I've wanted to photograph these services for a while now and though I'm far from the religious upbringing of my Appalachian childhood, I look forward to photographing in this community at some point. Why? I'm simply fascinated by an obedience that would call one to take up a serpent as an act of worship. I'd like to photograph these services as a celebration of faith and tradition. It's important to not just view this book as a serpent-handling album. Schwartz goes much deeper, writing at length about other pentecostal holiness practices, which are equally as fascinating to me: speaking in tongues, foot washing, and singing are just as much a part of this book as serpent handling. And Schwartz is surprisingly reflective about his time spent documenting these practices (from 1992 to 1994). He writes, "I think about how pervasive the music is, about how every cell in your body is shocked by a spiritual presence, about how the handling of serpents and the anointing are seamless. The music and the Holy Spirit are at one. Where does the music stop and the spiritual anointing begin?" "I believe that the writer has another eye, not a literal eye, but an eye on the inside of his head. It is the eye with which he sees the imaginary, three-dimensional world where the story he is writing takes place. But is also the eye with which the writer beholds the connectedness of things, of past, present, and future. The writer's literal eyes are like vestigial organs, useless except to record physical details. The only eye worth talking about is the eye in the middle of the writer's head, the one that casts its pale, sorrowful light backward over the past and forward into the future, taking everything in at once, the whole story, from beginning to end." Before I continue, I should let you know that if you're expecting technically superb, sharp images from Schwartz's book, you'll be sorely disappointed. What the book lacks in technical merit, it more than makes up for with the supplemental text and depth of the work in its entirety. I appreciate the level of detail in the captions, too. Each caption includes an exact date and location. "The photographs were taken with 35mm, 400 ASA film, without flash, in an effort to intrude as little as possible upon the services. As a result, the film was "push-processed" two and three stops. The pronounced grain and the strient patterns of light in these images are the result of this process and of my desire to have the photographs represent the mood of the spiritual experiences. The photographs and essays record the complex and sometimes humorous social interactions that I encountered and provide an intimate glimpse into serpent-handling practices and beliefs, moving beyond the stereotypes of Appalachian snake charmers and fire eaters to illustrate the deeply personal and communal spirituality that is an integral element of the services." It's clear to me that though Schwartz took a scholarly approach to the fieldwork conducted for this book, much like Covington's journalistic approach to Salvation on Sand Mountain, both men experienced far more than they bargained for. I don't think it was an accident that I discovered these two books at roughly the same time I began researching this community with hopes of making pictures. Together, these books have helped reinforce my interest in the subject and my desire to experience the community firsthand. Schwartz writes, "Everything seems so natural, yet the media's blitz about a recent serpent-handling fatality paints a much darker and more sinister picture of these people. However, I am drawn by a brighter image." It's usually then, and only then, that the media's attention is on this tradition. It's important to note that this isn't a widespread Appalachian religious tradition contrary to popular belief. However, when there are fatalities, such as Mack Wolford in West Virginia in 2012 and Jamie Coots in Kentucky in 2014, the notion that serpent handling is a common part of worship in rural churches throughout Appalachia is once again perpetuated. "It's not true that you become used to the noise and confusion of a snake-handling Holiness service. On the contrary, you become enmeshed in it. It is theater at its most intricate - improvisational, spiritual jazz. The more you experience it, the more attentive you are to the shifts in the surface and the dark shoals underneath. For every outward sign, there is a spiritual equivalent. When somebody falls to his knees, a specific problem presents itself, and the others know exactly what to do, whether it's oil for a healing, or a prayer cloth thrown over the shoulders, or a devil that needs to be cast out." I think this is a fine addition to any collection of books about Appalachia and highly recommend it. I can thank Instagram and cell phone photography for leading me to the beautiful analog work of Hunter Barnes. 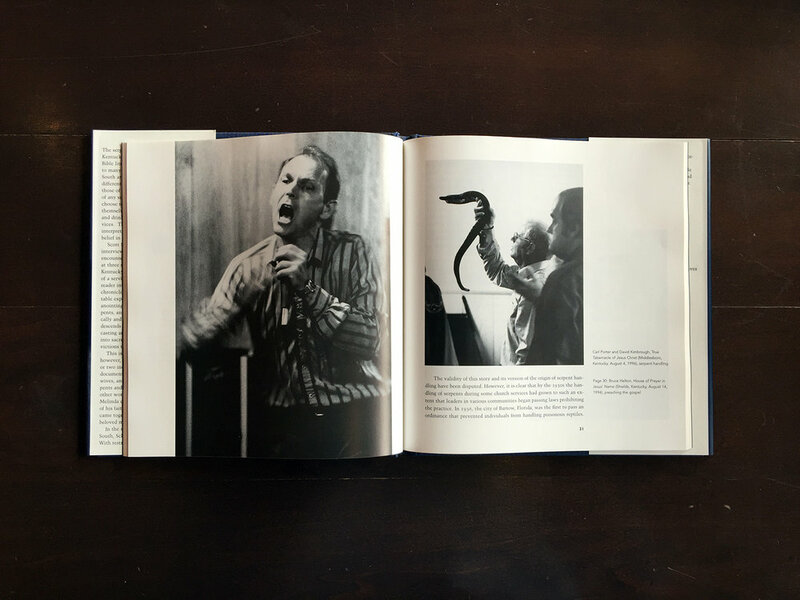 I saw an image of Barnes' book, A Testimony of Serpent Handling, in someone's feed, Googled the photographer, and landed smack dab in the middle of this intimate and quiet work. I reached out to Barnes and asked if he'd be interested in collaborating on something for Looking at Appalachia and he agreed. Barnes' project statement echoes many of the thoughts and emotions I've been unable to express in my own writing. Coupled with the photographs, I sensed an honesty that's hard to prop up for any length of time without being authentic. My hour-long conversation with him reinforced my initial sentiment; he's genuine. From the project statement: "Where there is love and unity there is power. Feeling this is what has drawn me to document this in true belief. Within their church a clear path knowing ultimate freedom and victory over all things. Light felt so pure that shines beyond all. At a pivotal point in a new time proclaiming the word that has not changed. As to live what they know is undoubtedly right and not to tempt in disbelief. An old way for so many is passing, as lived strong for those who choose this way. Walking all verses and chapters of the King James Version to save a soul and enter the pearly gates. In these West Virginia mountains live and breathe the anointing, within the people who do not stray. Children of God who rise above in the ways of old. A family of faith who so graciously invited me in. Said to me of handling serpents, like all true love, the journey is one better felt than told." What we see in these photographs, in these moments, is access to intimacy. Barnes noted that the only real thing Wolford expected in return was accuracy. He wanted to spread the word about his faith, but he wanted it done accurately. By all accounts, Barnes has done just that. As a native West Virginian, I'm often skeptical of anyone - either insider or outsider - who wants to photograph this practice. I even question my own motivations. What can I show that hasn't already been shown? I've yet to work that out in my practice, but Barnes has managed to celebrate this act of faith and obedience in a manner that is quiet, honest, and intensely beautiful. All photographs © Hunter Barnes.